Jumbo Shrimp – From SpongePedia, the biggest SpongeBob-wiki in the world! The Jumbo Shrimp is one of Mermaid Man and Barnacle Boy's arch enemies. 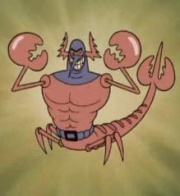 He looks like a big lobster and he may be related to Larry. He also has a sharp tail, a mask, and a belt. In Mermaid Man and Barnacle Boy II, the Dreaded Jumbo Shrimp is shown as a cardboard model. Jumbo Shrimp has a different appearance in Mermaid Man and Barnacle Boy II. He also has a different appearance in The Yellow Avenger. He looks more muscular. This page was last modified on 31 March 2013, at 08:28. This page has been accessed 10,002 times.